It requires a degree of self-importance to presume to critique such a prolific writer as James Patterson. His words have been reviewed, questioned, and praised since his early published works in the mid 1970s through the first decade of the 21st century. How does one find something new and fresh to say about the book of a man who has written more than 60 books over a three-decade long career and still has more books on the way? How does one man average more than six books per year over a six-year period and top the 26 that came before? James Patterson has secured his place in American literature through his creative endeavors in the thriller and suspense genre. He has subsequently secured a place for his character American psychologist, Alex Cross, by placing him in many different believable—along with several less than believable—situations and then allowing him to saunter home to his family. I, Alex Cross is no exception to Patterson’s formula. The interruption of Cross’ birthday party is typical fare and can well be expected by the reader. 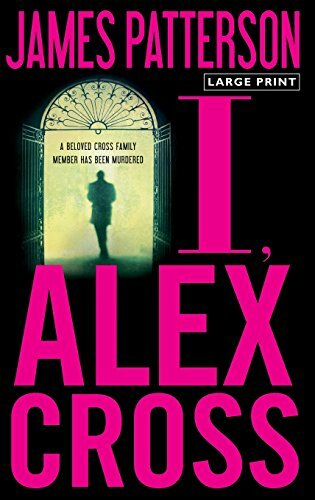 It becomes a personal matter when Cross reveals that his niece, who has not, to my recollection surfaced in earlier novels, is the victim of a heinous crime. As his investigation progresses, it is revealed that the niece was a high-priced prostitute involved in a multi-tiered ring including highly placed business men and politicians, which, if revealed threatens to unleash a major cover-up that reaches the top echelon at the White House. Interspersed with the gruesome details laid out in the meticulous search for criminals evading the reach of the nation’s top criminologists is the very personal event in Alex Cross’ life as his beloved Nana floats in and out of death’s doorway, never sure when the final curtain may fall. Alex expertly maneuvers between his two roles to console his family and give hope to Nana, while never missing a beat in his search for Zeus, the monstrous killer of young, naïve, ladies of the evening. Even in the face of warnings from the highest levels of government, Alex trudges onward to find the most unusual and treacherous of weapons operated by a madman without soul. Meanwhile Nana lingers in and out of consciousness, leaving one to wonder whether she is indestructible or just a somewhat boring diversion from the more egregious tasks facing Cross. Diehard fans of Patterson laud the family interactions, while many followers begin a slow descent into a dark abyss of searching for a mystery writer with more fresh ideas to weave into a complex storyline. To this reviewer, I, Alex Cross begins a downhill slide for this character and his family. Perhaps he needs to expand his horizons and lead his fiancé away from the tight family circle and into newer dimensions of life. Overall, this is a good read with periods of boredom interspersed with exciting criminology—and a surprise twist—to wrap it all up into a very nice package.